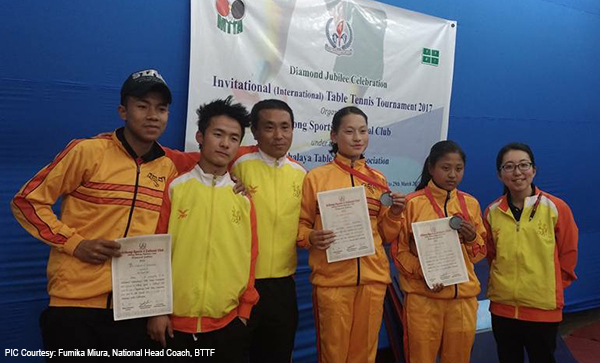 Two Bhutanese girls brought home a bronze medal from the International Invitational Diamond Jubilee Table Tennis championship. The tournament was held last week in Shillong, India. Bhutan secured the medal after defeating Nepal in the women’s doubles category. “Initially we did not expect to win but we gained the confidence to do it during the game as my partner played really well. We practiced everyday for two hours before the competition,” said Sonam Deki, one of the medallists. Two boys and two girls represented Bhutan in the championship. Assistant national coach for table tennis, Dala Thinley mentioned that the girls performed really well. He added the federation will focus more on training women as the benchmark for women table tennis players across the Asian countries is not as high as that of men’s.